The Air Pro Series sets a completely revised new standard in Nitrox production. It is a completely integrated system which will withstand even the most hardest conditions. 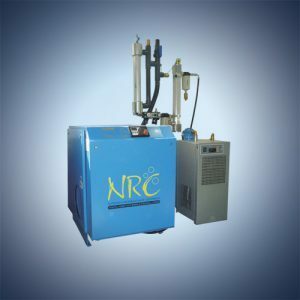 The control and monitoring systems of the Air Pro Series are simplified even further than existing NRC gas manage­ment range. All necessary infor­mation like pressure, oil tempera­ture and service intervals is presented on a clear and easy to read LCD display on the front panel. The assembly effort decreases to a minimum, because the system is delivered ready for use and tested. In the NRC Air Pro Series system, a power reduced rotary screw compressor per­formes its work. Maximum durability and operation period is guaranteed by the power reduction of this special system. The access to the low pressure compressor, refrigerant dryer and filter system has been optimized, so service and maintenance allows the technician uncomplicated and unimpeded access to the whole system. A special “Tropical Kit” (optional) on the Air Pro Series ensures a high standard of performance even at very high ambient air temperature and humidity. The dry and clean air from the low pressure compressor passes a triple filter array then passes, as oil free and high purity breathing air, into a hollow fibre membrane. The membrane body is a specially designed oxygen module, which dis­tinguishes itself by its excellent air quality and air supply performance. The performance of the fibre membrane is limited by a safety valve to ensure a long constant economic life-time.